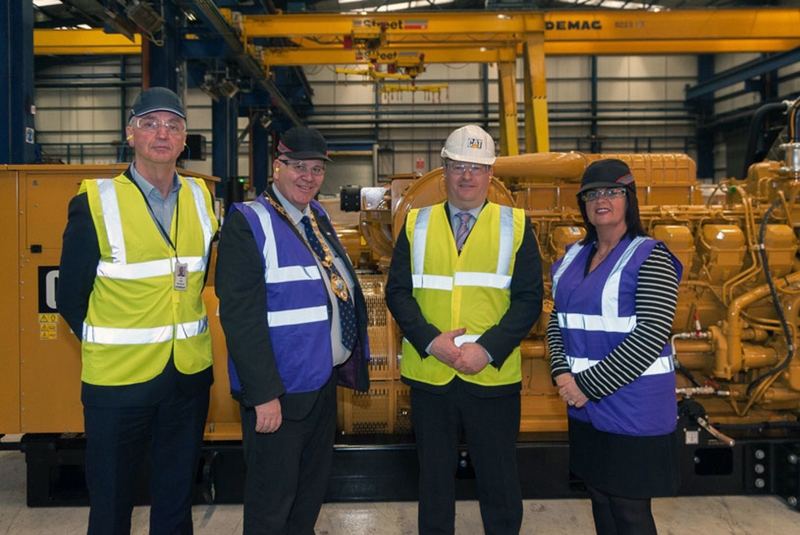 Mayor of Mid and East Antrim Councillor Paul Reid praised the innovation of Caterpillar and its contribution to the surrounding community during a recent tour of its manufacturing plant in Larne. Founded in 1966, Caterpillar (NI) Limited is Europe's largest diesel generating set manufacturer. In Northern Ireland, the company’s Electric Power operations are based in Larne, where final assembly and fabrication of the product takes place before export around the globe. The Mayor said: “Mid and East Antrim is traditionally recognised as the manufacturing heartland of Northern Ireland, with significant strengths in advanced manufacturing, accounting for one in five jobs in the region. “This reputation has been developed thanks to the investment of successful global companies such as Caterpillar, who have benefited from the high-level manufacturing skills available within Mid and East Antrim. “The strategic location of Mid and East Antrim means that it also benefits from good transport infrastructure. “With its close proximity to both Belfast International and Belfast City airports, as well as Belfast port and the port of Larne, it makes it a very easy location for global companies such as Caterpillar to do business. “Caterpillar and the Council enjoy a strong working relationship and we look forward to building on that through the Manufacturing Task Force. The Manufacturing Task Force, chaired by manufacturing expert Rose Mary Stalker, who has 25 years’ experience working with multinational firms, is committed to protecting the Borough’s economy, build on its existing strengths, identify opportunities for growth and improve Mid and East Antrim’s competitiveness. It will bring together key stakeholders to help define a bold and new agenda for action as Mid and East Antrim looks to rebalance itself economically and provide a strong platform for economic growth and job creation. With the consultation phase entering its final stage, the first Manufacturing Task Force workshop to share issues, ideas and recommendations, will be held at ECOS on Thursday 19 April. E: ChairMTF@midandeastantrim.gov.uk or any of the Economic Development Team at Mid and East Antrim Borough Council.